When the Arctic is Closed, the Sun always melts more Ice than Snow Replaces Each Year. When the ice sheets are thin enough, ice retreats and the Earth Warms. This does mean that during Younger Dryas, water from melted ice sheets did dump liquid water into the Oceans to cause the Cooling of the Younger Dryas Period. 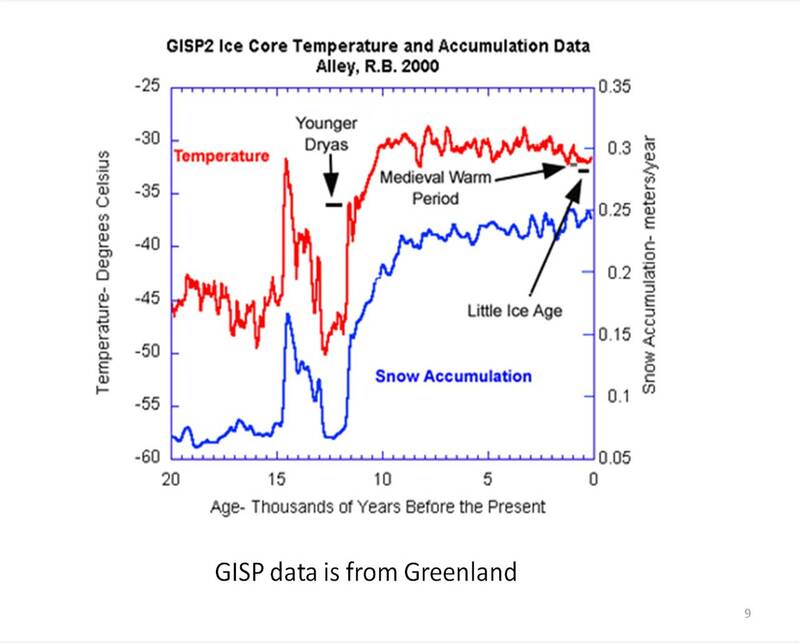 Liquid water entered the Arctic and caused the snow necessary for the Younger Dryas Cooling. When the liquid water in the Arctic Froze, Younger Dryas cooling ended and warming resumed. The 8.2 k event dumped more water and now, with water still flowing under the Arctic Ice, earth temperature has been well bounded for ten thousand years. If, ten thousand years ago, the Arctic did not Open, The warming would not, could not, stop there and warming would have continued to higher values. Warming continues when the Arctic is Closed. The Arctic has been open many times during the past ten thousand years. There is no way to put an upper limit on temperature until much of the ice is gone. All the ice is not gone so the Arctic did open every time it was needed. The Arctic had to open, during every warm time in the past ten thousand years. That is the only thing that puts a limit on how warm we get. That is the only thing that can put a limit on how warm we can get.